If you have pets, you probably use flea repellent products on them, like collars or spot-on treatments. But have you ever thought about having fleas on your body? Sure, people get head lice sometimes, but can we get fleas, too? It’s a little scary, when you think about it, because we know how fleas can make our pets miserable. Fleas may occasionally bite humans, but most flea species do not choose to live on human hosts. There are more than 2,000 flea species, and only one would choose a human as an acceptable host. People have remarked on more than a single “human flea”, but as far as the medical community is concerned, only one species will actually live on humans. That doesn’t mean you’re safe from flea bites, though. Many species that prefer dogs or cats are not at all shy about biting humans, if given the opportunity. Just as the fleas that live on dogs and cats, and other warm-blooded animals, fleas that may live on humans feed from their hosts’ blood. They need blood in order to survive, and for reproduction. Adult fleas may be able to live for up to one year without taking in sustenance, but emerging adults die within several days if they can’t find a host, and thus a supply of blood. The human flea has a very appropriate name. Its scientific name is Pulex irritans, and it is indeed an irritating little bug. It is known to be a cosmopolitan flea, and sometimes is classified as this, since it may use different animals in the home as hosts. If your house is infested with P. irritans, you may have fleas on yourself, as well as other people, dogs, cats, carpets and pet bedding. There is not much in the way of a positive relationship between this flea and the humans it feasts on. Their bites are irritating. In addition, they often serve as vectors for disease, and one of those is plague. 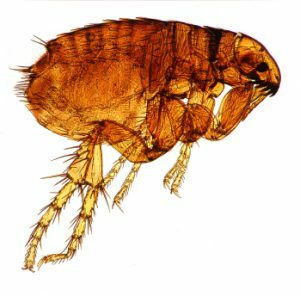 Fleas on humans do not often spread disease anymore, but they were part of the Black Death, a plague that took place in the Middle Ages. You probably think of fleas like being as athletic, like tiny kangaroos. Their appearance is that of a creature with a slightly slender body, something to bite you with, on a tiny head, and long hind legs. Fleas have six legs, actually, but no wings. Their hind legs can propel them when they need to escape something or when they sense nearby hosts. When these insects reside on hosts, they use their other legs for the purpose of moving around. Their thin bodies help them to move quite easily through what might seem like a forest full of hair shafts. When P. irritans fleas use humans as hosts, they spend most of their time in your clothing, unless they’re feeding. They can also live in your hair or a full beard. This means that if you have a human type flea problem, just bathing and shampooing won’t always take care of it. There may be more fleas waiting in your bedding or clothing for you, their new source of food. They spend more time in an area of your home where you spend time, too, just jumping on you when they need blood. How can fleas find you? You’re probably wondering how human-host fleas can find you. Since they use dogs and cats as hosts, too, they can simply hop onto you from your pets. They may also hang around in your carpet and hop on you as you’re walking by. They sense where you are by using carbon dioxide you exhale, vibrations, changes in light and by your human odor. As a human, you can’t rely on stealth technology to avoid fleas, either. Most fleas can jump about one foot in just 2/100 of one second, and this makes it difficult for you to get out of the way if they want to land on you. 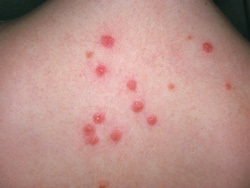 Symptoms of flea bites typically include a rash or small bumps in the bite area. They are smaller than mosquito bites, although a bit similar in appearance. You may see the bites in groups. If you’re allergic to fleas, you may experience hives over a wider area. They may also swell, but usually this only occurs in the immediate bite area. The most common flea bite symptom is itching. It can be severe in some cases, and you may itch in areas where no flea bites appear. The bumps from flea bites may bleed if you press them, but bleeding is usually caused by scratching. It is possible to catch diseases from human-host fleas, but the chances are remote. Secondary infections from your scratching may result in complications or further symptoms, though. Flea bites can occur in nearly any area. They seem to prefer the ankles and the waist, and other places where clothing is in close contact with your skin. Skin folds and armpits are other locations that fleas prefer. There are numerous ways of treating the symptoms of flea bites, but if you don’t eliminate the fleas, you’ll just continue being bitten. 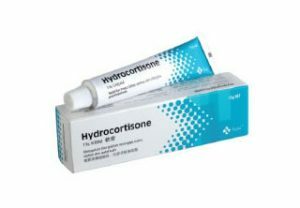 Anti-itch creams work well, as do lotions that calm the skin. Antihistamines are generally effective, too. If you take a hot bath with a bit of lemon extract and detergent in the water, this will be quite helpful, and will kill fleas that are still on your body, too. Taking hot baths is better than taking hot showers. You may use your normal shampoo, but this will be more effective if you shampoo first, and allow your shampoo to remain in your hair until you’re finished with your bath, before rinsing it. Apply a lotion or cream to any flea-bit areas after you are finished with your bath. This will help you to feel better. Even after you take a long, hot bath, don’t kid yourself that this alone will get rid of your flea problem. You may have killed some fleas, but there are almost certainly more of them waiting in your clothing and carpets. You need to do a lot more to ensure that your home is free of fleas. If you prefer, you can have a professional exterminator come to your home, to get rid of virtually all the fleas infesting it. 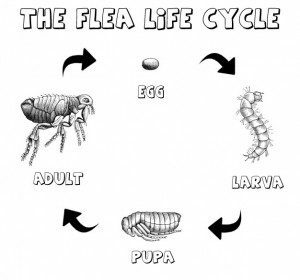 One problem is that fleas have a complex life cycle, and this makes it hard to kill them all in one swoop. It generally will take more than one attack to kill them all. If you’ve placed yourself in charge of killing off your fleas, you and other family members need to take hot baths every day or two. This also applies to your dogs and cats. Dogs are usually a lot easier to bathe than cats. Felines don’t cooperate with the whole bathing plan very well, since they hate water. If you have to, you can use flea dust on your cats, instead of trying to bathe them. Be sure you use cat flea products for your cats and dog flea products for your dogs. Most flea products are well-suited to dogs, but they can cause irritation to people and cats. To win the war against fleas, you need to clean the entire house, since fleas in your house are only one hop away from being fleas on humans. Sprinkling baking soda in your carpet is one good way to get rid of a lot of fleas. Baking soda isn’t harmful to your carpet, but it dehydrates and kills fleas that may be hiding there. 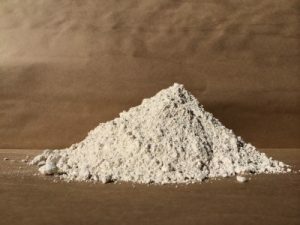 There are other types of powders you can sprinkle in carpeting or spread in your house, too, like diatomaceous earth, which also causes fleas to dehydrate. Be careful not to breathe in any powders you are using, and check any commercial products before you buy one, to make sure they are not toxic to your pets or yourself. To test whether your powdering was effective, you can walk over your carpet wearing white socks. Picking up tiny specs on those white socks usually means you still have fleas in the carpet. If you happen to see individual fleas, and you can catch them, this can be accomplished through hair combing. Trying to kill fleas by crushing them with your fingers or hand does not usually work, since their exterior shells are very hard. Instead, use a pair of tweezers to do the job, or try smashing them between two hard surfaces. Fleas on humans are not to be trifled with, since they are so tough to get rid of. You must deal not only with the fleas affecting you, but also potential fleas in your entire home environment. Put flea collars on your pets. There isn’t yet a flea repellent product safe for humans, which would also be effective for killing and repelling P. irritans. Previous articleWhat Does It Mean When Your Veins Show? Next articleHow Long Does Klonopin Last?